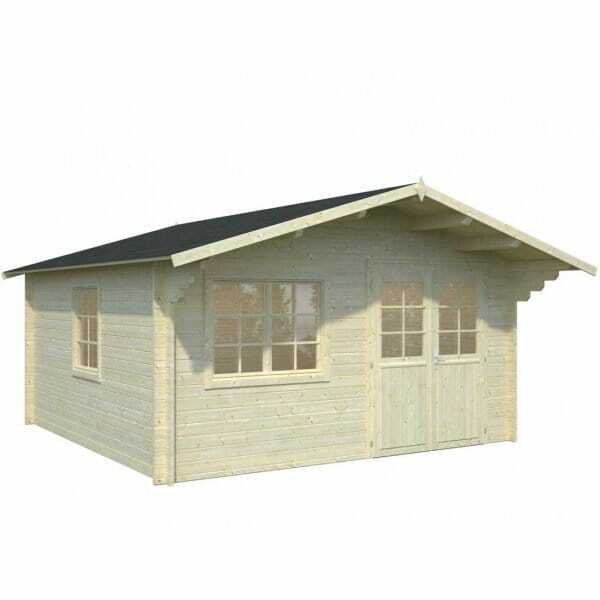 Palmako Britta 17.5m² Log Cabin: The Palmako Britta 17.5m² Log Cabin has 44mm wall planks and a 90cm canopy. The cabin comes with double doors with one double and one single windows all of which open using tilt and turn operation. The Palmako Britta 17.5m/sq Log Cabin can be built with the door biased to the left or the right in the front wall - the front window is then positioned accordingly. The window in the side of the cabin can be position into either left or right hand side of your choice during assembly. This lovely log cabin will be a delightful addition for any garden and the ideal place to spend time in your garden. The Palmako Britta 17.5m/sq Log Cabin can be used in a variety of ways the choice is up to you ? from Simply Log Cabins.